The energy rises as the sun sets at the Richmond Night Market. The Richmond Night Market boasts authentically Asian snacks and street food, like tornado potatoes, grilled squid, fresh mango desserts, dragon’s beard candy, bubble waffles, and so much more. Every year, vendors work hard to introduce new foods that taste great and look good on camera. You’ll also find retailers selling unique accessories and knick-knacks at street-side prices. Some merchants are willing to bargain, so give it a try! Channel your inner negotiator and you’ll leave with a haul of cool products. Along with food and shopping, there’s a diverse array of nightly live entertainment ranging from music and dance performances to carnival games and rides. Excited yet? Good, because everyone else is, too. This can mean big crowds and lineups for things like ATMs and parking (which is free). Since the night market is mostly cash-only, you’ll want to visit an ATM before you go. As for parking, leave the car behind and take public transit or carpool if you can! You can take the Canada Line SkyTrain to Bridgeport Station and then walk west along River Road to get to the Richmond Night Market. Bring your patience—lineups to get in can be long, but you can buy a transferable Zoom Pass for express entrance if you plan to visit often (it&apos;s good for multiple entrances). Get there early if you don’t have a Zoom Pass—it can take an hour or longer to get in! 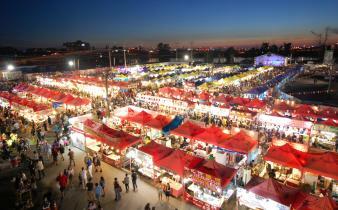 In the event of inclement weather, be sure to check the Richmond Night Market&apos;s Facebook page for updates. By transit: Take the Canada Line SkyTrain to Bridgeport Station and then walk west along River Road to the market. Check the Richmond Night Market&apos;s Facebook page for updates in the event of inclement weather.